It is important to note that PostgreSQL from version 9.3 has the necessary infrastructure to support labeling of database objects via external 'providers'. An sepgsql extension has been added that provides SELinux labeling. This is not installed by default but as an option as outlined in the sections that follow. Because of these changes the original version 9.0 patches are no longer supported (i.e. the SE-PostgreSQL database engine is replaced by PostgreSQL database engine 9.3 plus the sepgsql extension). A consequence of this change is that row level labeling is no longer supported. The sepgsql extension adds SELinux mandatory access controls (MAC) to database objects such as tables, columns, views, functions, schemas and sequences. Figure 1 shows a simple database with one table, two columns and three rows, each with their object class and associated security context (the Internal Tables section shows these entries from the testdb database in the Notebook tarball example). The database object classes and permissions are described in the Object Classes and Permissions section. Figure 1: Database Security Context Information - Showing the security contexts that can be associated to a schema, table and columns. To use SE-PostgreSQL each GNU / Linux user must have a valid PostgreSQL database role (not to be confused with an SELinux role). The default installation automatically adds a user called pgsql with a suitable database role. 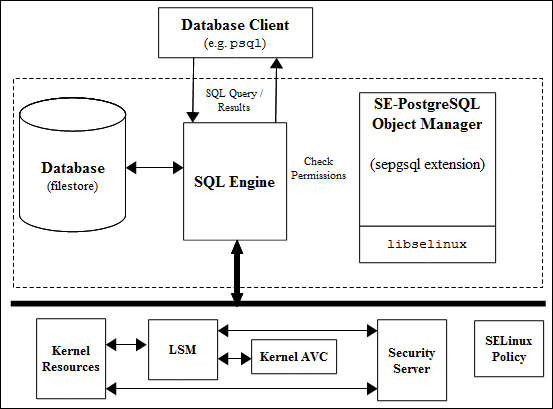 Using the SE-PostgreSQL Services diagram, the database client application (that could be provided by an API for Perl/PHP or some other programming language) connects to a database and executes SQL commands. As the SQL commands are processed by PostgreSQL, each operation performed on an object is checked by the object manager (OM) to see if the opration is allowed by the security policy or not. SE-PostgreSQL supports SELinux services via the libselinux library with AVC audits being logged into the standard PostgreSQL file as described in the outline Logging Security Events section. The http://www.postgresql.org/docs/devel/static/sepgsql.html page contains all the information required to install PostgreSQL and the sepgsql extension, however the Notebook tarball sepgsql-9.3/README file also explains this and adds a simple test database. sepgsql_getcon() Returns the client security context. sepgsql_mcstrans_in(text con) Translates the readable range of the context into raw format provided the mcstransd daemon is running. sepgsql_mcstrans_out(text con) Translates the raw range of the context into readable format provided the mcstransd daemon is running. sepgsql_restorecon(text specfile) Sets security contexts on all database objects (must be superuser) according to the specfile. This is normally used for initialisation of the database by the sepgsql.sql script. If the parameter is NULL, then the default sepgsql_contexts file is used. See selabel_db(5) details. These entries are optional and default to 'off'. The 'custom_variable_classes' entry must contain 'sepgsql' to enable these to be configured. SE-PostgreSQL manages its own AVC audit entries in the standard PostgreSQL log normally located within the /var/lib/pgsql/data/pg_log directory and by default only errors are logged (Note that there are no SE-PostgreSQL AVC entries added to the standard audit.log). The 'sepgsql.debug_audit = on' can be set to log all audit events. To support the overall database operation PostgreSQL has internal tables in the system catalog that hold information relating to databases, tables etc. This section will only highlight the pg_seclabel table that holds the security label and other references. The pg_seclabel is described in Table 1 that has been taken from http://www.postgresql.org/docs/9.3/static/catalog-pg-seclabel.html. objoid oid any OID column The OID of the object this security label pertains to. classoid oid pg_class.oid The OID of the system catalog this object appears in. objsubid int4 For a security label on a table column, this is the column number (the objoid and classoid refer to the table itself). For all other objects this column is zero. provider text The label provider associated with this label. Currently only SELinux is supported. The first entry is the schema, the second entry is the table itself, and the third and fourth entries are columns 1 and 2. This page was last modified on 25 September 2015, at 14:06.